I debated for quite some time trying to figure out the best way to mount the glass and also the dimensions I would need for the glass. To help, I cut out a piece of cardboard that was the same size as the controller top. I placed this into position on the cabinet so I would have some idea of where the glass would mount and how much of the glass should be exposed. I chose to have the glass sheet set back into the cabinet about an inch (rather than have it flush with the front of the cabinet). Once I determined the setback, I drew a line on both inside walls of the cabinet to represent where the glass would sit. I determined that I could create the bottom mount below where the controller would mount (i.e. 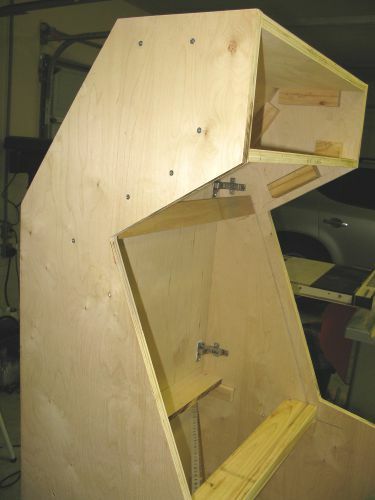 the controller would hide the mount) and the top mount would extend up beyond the speaker mount board. I puzzled over how to create a glass mount on the bottom that would be strong and hold the glass at the correct angle. I ended up measuring the angle that the glass would sit at (relative to straight up) and then used my table saw to cut a slot lengthwise in a 2x4. I mounted the 2x4 in place between the cabinet sides and then mounted a small flat board at the top. The glass rests against this flat board at the top and I use standard glass/mirror hangars to hold it in place. Once the mounts were finished, I cut out a piece of cardboard that would represent the glass. Once I had it correctly sized (remembering to leave a small amount of gap on the sides so the glass wouldn't be too hard to install or become pinched if the cabinet shifted), I went to my local glass shop and had them order me a piece of tempered glass to size. part of the glass and hides the top glass mount. I planned on buying a normal set of computer speakers and mounting them (via bracket and bolt) to the inside of this board. Since I wanted the entire cabinet to be internally connected, I chose to glue carriage bolts to this board to be held by wingnuts on the inside. I glued and screwed wider blocks to the cabinet sides and then drilled the guide holes for the speaker grill carriage bolts to fit through. 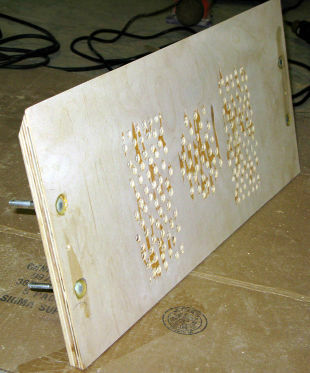 In order for the sound to make its way through this board, I drilled a bunch of holes with a large drill bit. I didn't make it too pretty because I new I would be covering this board with black speaker cloth (using spray rubber cement). The subwoofer would be mounted down at the bottom of the cabinet. To add some realism to the cabinet, I decided to install a fake coin door from Suzo Happ. on the front cabinet door. They do sell real coin doors with a real mechanism, but I wasn't interested in creating that much realism (or spending the extra money for it).